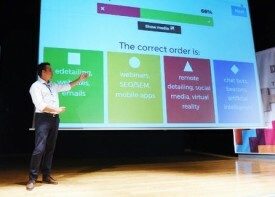 Your teams compete around an interactive quiz on the big screen that can accommodate 20 to 100 people. 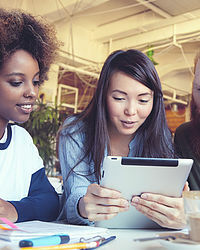 The Quiz Time is a modern interactive team building activity, your teams compete each others using one or more tablets in very fan environment. The all game is manager by a Quiz Master to make the challenge even more fun. All the teams can follow the results life on the a big screen to put more excitement to the challenge! Questions are multiple choice, Music, Movies, Celebrities, Animals, Sport and we also offer the possibility to include personalized questions based on your company/client. 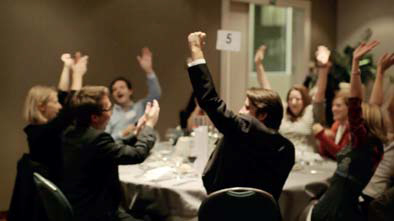 A Quiz Time is perfect game for a fun team event during a dinner, recreation or meeting with questions adapted to the occasion. • Logo can be integrated. ​HOST: Quizmaster for an interactive animation.